Journey are streaming a performance of “Separate Ways (Worlds Apart)” as a preview to an expanded version of their 2009 set, “Live In Manila”, ahead of its North American release on September 9. The lead single from 1983’s “Frontiers” peaked at No. 8 on the US Billboard Hot 100 and helped the project hit No. 2 on the Billboard 200 on its way to sales of more than 6 million copies in the States alone. The tune follows “Don’t Stop Believin’” as the latest preview to the updated package that presents Journey’s concert at the SM Mall Of Asia in Manila, Philippines on March 14th, 2009. The event marked the homecoming of the band’s then-newly arrived singer and frontman Arnel Pineda, who was discovered by founder and guitarist Neal Schon singing Journey covers on YouTube with Filipino band The Zoo. 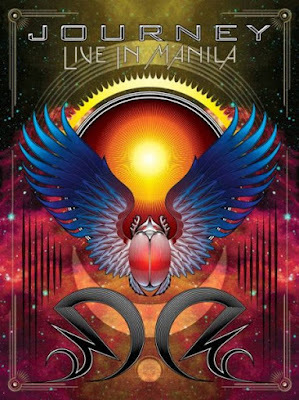 “Live In Manila” will be released via DVD+2CD, Blu-ray+2CD, and digital formats, and is the first time the audio has been available anywhere in the world. Journey are winding down an extensive tour of North America with The Doobie Brothers and guest Dave Mason, which wraps up in Wheatland, CA on September 2. The group will then headline San Francisco Fest at the city’s AT&T Park on September 4 alongside Santana, The Steve Miller Band, The Doobie Brothers and Tower Of Power.